The Vegas four wide race is done in 3 days, just like Four wide in Charlotte. Its a challenging race for the pro’s, but for the Sportsman its just another national event. The fields are always full in the sportsman ranks as it is a very popular race to attend. 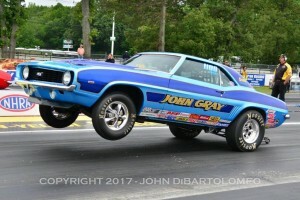 This years Four Wide, and with great weather as always gave us a some new winners along with some veterans taking on a tough field of competition. With 7 sportsman classes competing and full fields, you would expect some problems getting the race completed. It was not to be as the weather was perfect and the race was finished Sunday afternoon. The Sportsman winners got there interview in front of the fans as it should be. 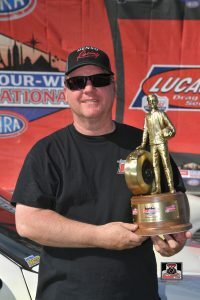 Lambeck came from the nunber 2 spot, Lee was the number 1 qualifier. Both drivers had similar CIC penalties. Lee still had a slight performance advantage, but was late on the tree and could and stay ahead of Lambeck. 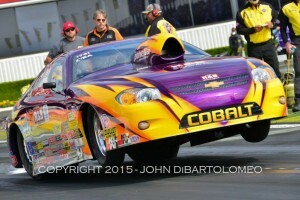 Lambeck has another strong run and gets his 13th NHRA national event win. Bertozzi was on his game the whole race. Thomas is .017 on the tree and dead on with a .002, Bertozzi is .008 on the tree and dead with a .004. Betrozzi’s 12 pack was what he needed to take out Thomas very tough 17 package. 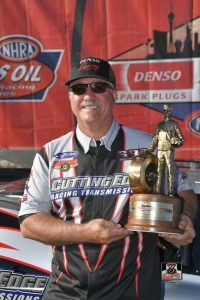 Bertozzi picks up his 23 NHRA national event win. 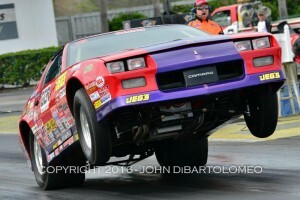 When you think of Stock and Super Stock you think heads up racing. Well the final of Stock was no disappointment. Jerome and Mangus were pretty evenly matched in this E/SA final. Mangus is .028 on the tree, but Jerome is .007 and never looks back as he outruns Mangus with a 10.818 to a 10.858. 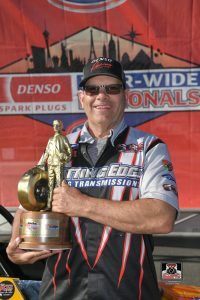 Jerome is a first time NHRA national event winner with his heads up final. Perivolaris has his hands full with one of the toughest top bulb racers in the country. Perivolaris has averaged a .009 light all week making him the racer to beat in this final. Neither driver will give up the stripe. Bogacki is .019 on the tree and follows Perivolaris through, he is .005 but only breaks out by .012 to Bogacki’ .024 breakout. 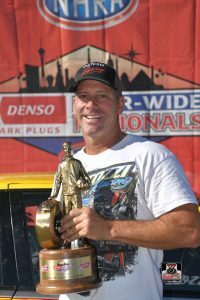 Perivolaris gets his third NHRA national event win. Hiatt’s looking for his first win. Williams has been here many times, but with a .022 and .017 over it would not get the job done. 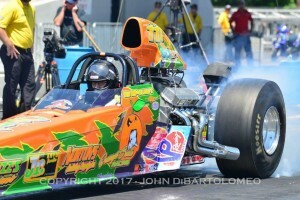 Hiatt was .010 on the tree and dead with a .006. 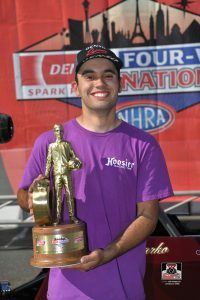 Hiatt picks up his 1st NHRA national event win. Both drivers are looking for their first national event win. Spiegel hits the tree hard with a .011. Tehle is dead on with a .004, buts its no match as he was a bit late with a .059 light. 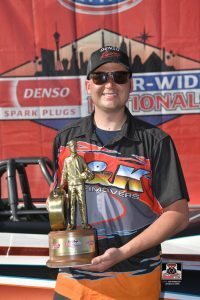 Spiegel gets his 1st NHRA national event win . This is one of the tightest races this week. Both drivers are on time and run .02 over their dial ins. Crumlich is slightly better on the tree, .007 to Gillette’s .010. Crumlich takes the close win running .021 over his dial to Gillette’s .023 over his dial. 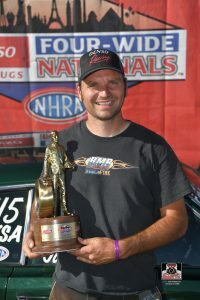 Crumlich, another first time NHRA national event winner.